Describe, explain, evaluate, compare, discuss. Command words tell you what you have to do in each question. Look out for these words in the GCSE Chemistry papers. Understanding what they mean and tailoring your answer to these instructions will both save you time and get you extra marks in the exam. A state (or give or name) question is the most straightforward type of command-word question in the exam. To answer it, you simply have to recall a fact, definition or equation and write it down. In a describe question, you simply have to say what you see (or what happened or what will happen). You won’t be awarded any marks for attempting to explain anything. In both of the examples below, we have underlined the clues in the question that guide you towards exactly what the examiner would like you to describe. EXAMPLE. 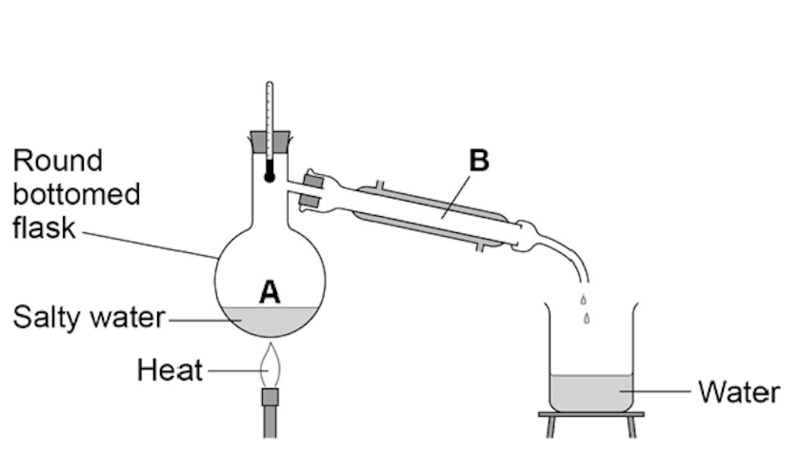 A student removed water from salty water using the apparatus below. Describe how this technique works by referring to the processes at A and B. Explain questions are usually more difficult (and so are normally awarded more marks) than describe questions. If a describe question asks you what happened, then the matching explain question will ask you why it happened. Watching My GCSE Science videos, doing lots of exam-style questions and reviewing the mark schemes will help you learn how to answer explain questions. You may be asked to explain something which seems unfamiliar. The key here is to identify the part of the course that the question relates to and then apply your knowledge of physics to the unfamiliar context. In a calculate question, you will normally have to choose the correct equation to use, substitute the right numbers into the right places, and write down your final answer. You may also be asked to include the correct unit with your answer, or to write it to a certain number of significant figures. In an evaluate question, you have to write down the advantages (pros) and the disadvantages (cons) of something. But with the 6-mark question below, the examiner is looking for more than items to tick off on a mark scheme. To get full marks, you need to write a detailed and coherent argument, which considers a range of pros and cons and comes to a conclusion consistent with your reasoning and that shows that you have a good understanding of the key ideas. ANSWER. 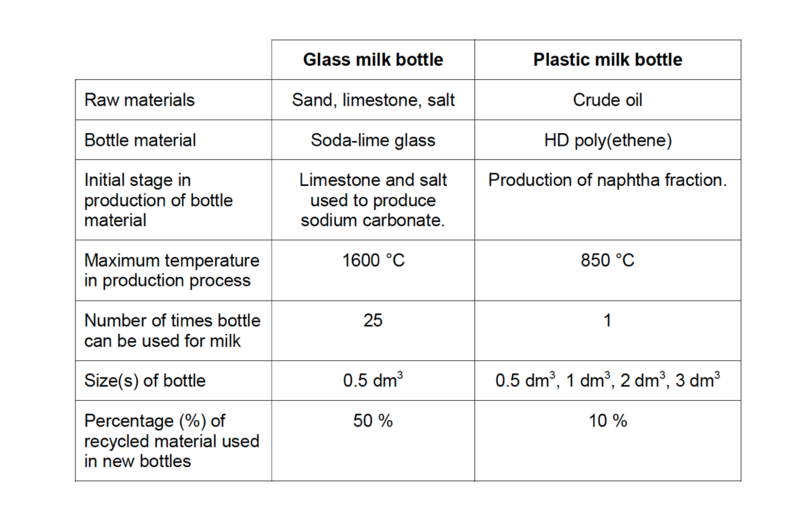 There are two stages in production of soda-lime glass. The second stage involves heating sand, limestone and sodium carbonate. In HDPE there are three stages in production. [The first stage is given in the question, so use your knowledge here to show that you understand the process]. The second stage involves cracking of naphtha to obtain ethene and the third stage involves the polymerisation of ethane. Fewer stages in glass production may be quicker. The higher temperature in glass manufacture may require more energy. Glass bottles can be reused although there may be costs associated with the collection/cleaning for reuse. Glass can be recycled into new products. Plastic has greater range of sizes. Both are produced from limited raw materials. Since a higher percentage of recycled materials is used to make new bottles, I would choose glass as it conserves raw materials. In a compare question, you have to write down the similarities and the differences between two (or more) things. Generally, a mark scheme will award the same number of marks for the similarities and differences, so be sure to include both. Discuss questions can be tricky since they are more open-ended than most other types of questions. To answer them successfully, you should have a good knowledge of the question topic and pay close attention to the wording of the question and the number of marks available. ANSWER. [Your answer does not have to include all the points in the mark scheme, but must demonstrate your understanding of scientific ideas in a clear, coherent and logical structure].